Try to hit your next jackpot this week at Slotastic Casino with a 100% weekly match bonus and 33 extra free spins to play the new Trigger Happy slot! Redeem the coupon code SLOTASTIC once a week from Monday to Friday to claim your bonus and play your favorite slot games. April depositors can claim a $25 monthly reward free chip with the coupon code 25REWARD and win up to $180, but do not claim two free bonuses in a row. Good luck! 50 Free Spins for NoLuckNeeded.com Players: New and existing players who registered an account via NoLuckNeeded.com can claim a 50 free spins no deposit bonus with the coupon code "NLN50FREE". Redeem the coupon code in the casino cashier. Terms and conditions apply. Free Spins Game: Trigger Happy slot; No Maximum Cashout! $20 minimum deposit. 30x wagering. Slotastic Terms & Conditions apply. Claim once a week Monday - Friday. No Maximum Cashout! $20 minimum deposit. 30x wagering. Slotastic Terms & Conditions apply. Claim TWICE per month. 50X Wagering Requirement; $200 Maximum Cashout. Max bet rule applies. Standard bonus terms apply. Do not claim two free bonuses in a row. *The 50 Free Spins promo code is valid for new and existing NoLuckNeeded.com affiliated players. *Players are not allowed to use two free bonus coupons in a row. Slots Playthrough: 60X; Maximum cashout: $180; $10 max bet. Claim Your Trigger Happy Free Spins and Bonus at Slotastic! 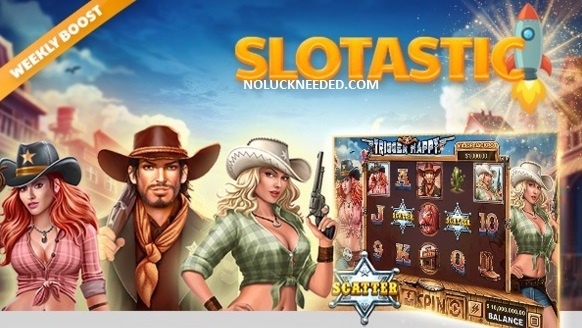 Slotastic is a NoLuckNeeded.com recommended online casino due to reliable player payments since they opened in 2009. Slotastic is a Real Time Gaming software casino that is available for play on multiple platforms including mobile, instant-play and download. Slotastic accepts Bitcoin for deposits and withdrawals. Players may also deposit with Litecoin and BitcoinCash. Click here to read or share Slotastic reviews and complaints in the noluckneeded.com casino directory.